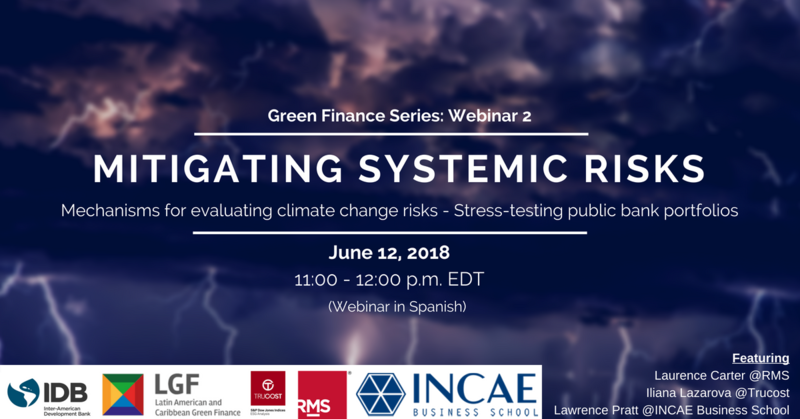 The Inter-American Development Bank, in collaboration with Trucost and RMS, will host the second part of its Green Finance webinar series: "MITIGATING SYSTEMIC RISKS: Mechanisms for evaluating climate change risks - Stress-testing public bank portfolios”. Laurence Carter from RMS and Iliana Lazarova from Trucost will present different approaches to stress- testing for financial institutions. The webinar aims to foster knowledge exchange and support National Development Banks and regulators in the development of optimized stress-testing methods and models. Lawrence Pratt from INCAE Business School will moderate the discussion. The webinar is particularly tailored to those working in public bank risk management and will take place on June 12, 2018 from 11:00 a.m. – 12:00 p.m. EDT.